Reviewer's comments: An excellent suite with components that are highly compatible with each other and the competition's. Word Perfect Quattro Pro's charting engine is much improved. The charts and their tools are accessible to both WordPerfect and Presentations. Chances are you're a Microsoft Office shop. But some of you might still be running the WordPerfect suite. Or maybe, now that Microsoft is preparing its next version of Office, you're open to the possibility of a new product, rather than an upgraded one. 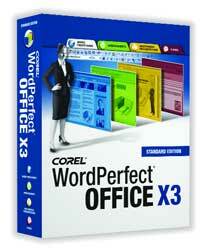 WordPerfect Office X3 is Corel's latest in a long line of suites. We grabbed a copy of it in the GCN Lab and were not disappointed. File conversion and compatibility have improved greatly. A long-time feature of WordPerfect has been robust Adobe Acrobat Portable Document Format publishing, but for the first time you can create a PDF from its spreadsheet, Quattro Pro X3. And the Publish to PDF feature of Presentations is better, allowing you to set a bookmark at every slide. Another area in which WordPerfect Office has always excelled is compatibility with its competitors. X3 allows you to open many different document formats and provides interfaces that resemble WordPerfect's competitors' so you don't have to learn another suite. When you start WordPerfect X3, a pop-up window gives you a choice between four interface modes: WordPerfect Mode, Microsoft Word Mode, WordPerfect Classic Mode (version 5.1) and WordPerfect Legal Mode. Although we looked at all four, we focused on WordPerfect Mode. The WordPerfect X3 interface is similar to the prior version's, with nine menus and the toolbars arrayed at the top. If anything, we thought there were too many menu items in the default configuration, making it difficult to find the one thing we needed. You can change this by going into Settings and editing each item of each menu until it's the way you want it. So while the actual interface has not improved significantly, WordPerfect X3 has definitely improved the level of customization. Document scrubbing, or removing metadata before saving, is definitely a hot topic among users nowadays. Fortunately, WordPerfect X3 addresses it. There's a 'Save Without Metadata ...' option right below the 'Save As ...' command, so starting the process is painless and easy. A window then opens with the file name and check boxes to indicate the types of metadata you'd like to remove. From headers/footers to routing slips to comments, you can choose which are kept and which are stripped out. WordPerfect expands on its already impressive level of file compatibility in a couple of ways. First the 'Save As ...' window gives you the option to save a document in any one of 77 formats, including five versions of AmiPro and three versions of XyWrite III. Basically, if a word processing program still exists in the world, WordPerfect X3 can export to it. The second compatibility advance is WordPerfect's ability to import PDFs. Yes, import. When you open a PDF file in Word Perfect X3, it pulls all the text out and puts it in a document, laid out with the images and objects that also appear in the PDF. Although the text we pulled in from various PDFs was nearly 100-percent accurate, layouts sometimes looked different. Quattro Pro X3 has seen some improvements, although not nearly as many as the flagship word processor has. When the program opens, it gives you the choice between three modes: Quattro Pro, Microsoft Excel and Lotus 1-2-3. This feature lets you select the interface you're most familiar with. Quattro Pro's charting tools and engine have been drastically overhauled. We found it much easier and quicker to create a chart than in earlier versions. What's more, the charts and their tools are accessible to both WordPerfect and Presentations. Speaking of Presentations, the module has been in the Corel family for years, but couldn't keep pace with Microsoft PowerPoint. That's starting to change. Presentations X3 has many new features. The sizeable increase in the number of available templates is definitely a bonus, and better anti-aliasing means fonts and images are cleaner and smoother. Add to that a nicer interface and the Publish to PDF feature, and Presentations could give PowerPoint a run for its money. While there is a sizeable percentage of users out there that prefer WordPerfect to Microsoft Word, the same cannot be said of the respective suites' e-mail programs. WordPerfect Mail X3 is good, arguably better than Outlook in many ways. But even its simple and powerful search tools, RSS feed management and robust spam protection will not be enough to overcome highly entrenched e-mail policies and the dominance of Exchange in e-mail servers. While it is just as good as its competitor, WordPerfect Mail X3 will never usurp Outlook's throne. A review of something like WordPerfect Office X3 will invariably touch on one question: How does it compare to the competition? While they are both strong products, WordPerfect Office X3's one major advantage over Microsoft Office 2007 is the one-year head start it has in the market.